Kaleena Mosqueda-Lewis: Kaleena was drafted #3 overall by the Seattle Storm in the 2015 WNBA Draft. pick by the Phoenix Mercury in the 2016 WNBA Draft. The Mater Dei lady monarchs basketball program has had a very accomplished and acclaimed history. Through a lot of hard work and some good fortune we have won numerous league, CIF and state championships. Perhaps most noteworthy among our many achievements is the fact that we have had several young ladies earn the privilege of playing basketball for their country. This page honors all the current and former lady monarch basketball players who have earned the distinct honor of representing their country as a member of USA basketball, or in the case of Nirra Fields Team Canada. We are all extremely proud of these young ladies who have made the Mater Dei basketball program even more distinguished. Great job ladies! Jayda Adams: Congratulations to Jayda who follows in her older sister Jordan's footsteps making team USA's under 16 roster just a couple weeks ago. Great job Jayda and best of luck to you as you prepare to make your international debut! 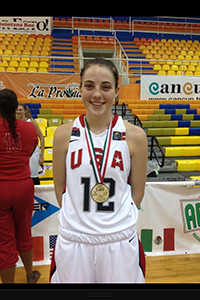 Katie Lou Samuelson: "Lou" has been an international mainstay for the last several years representing team USA on multiple occasions. She has been an integral part of the several medal winning teams she has played for. Katie Lou's Team USA Video. 3 on 3 Tourney 2013. 2014 Bronze medal winner for individual shootout contest. 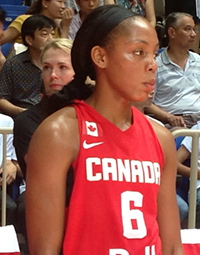 Nirra Fields: Nirra is considered to be one of the best women's basketball players in Canada. She has played for Team Canada in several international tournaments and congratulations are in order for recently making Canada's senior national team! What a fantastic accomplishment! 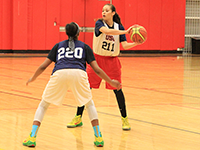 Article about Nirra making the 2015 national team. 2014 Article Naming the team. 2014 Article Getting ready for FIBA. Jordan Adams: Jayda's big sister has had a very stellar USA basketball career, and she is currently trying out for the US national team. Good Luck Jordan! 2009 Under 16 squad where she played with Mater Dei teammates Kaleena Mosqueda-Lewis and Alexyz Vaioletama. Alexyz Vaioletama: As part of the Big 3, along with Mater Dei teammates Jordan Adams and Kaleena Mosqueda-Lewis, Alexyz overcame serious injuries to have a noteworthy Team USA run. 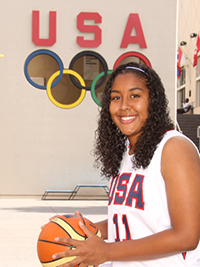 Kaleena Mosqueda-Lewis: The first international superstar to come out of the lady monarchs program, Kaleena's very successful team USA exploits told the hoops world what was to come, namely multiple championships at all levels of play, with more on the way? She is currently in the pool for team USA's National squad. Good luck Kaleena! 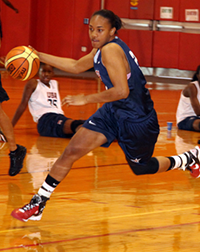 2013 Kaleena at home on team USA. 2014 Experience a key to success. 2014 Huskies dominate USA roster pool. 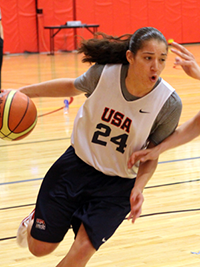 2014 Team USA announces 2014-16 roster pool.